Our warming world: How much difference will half-a-degree really make? After a week of intense negotiations, the Intergovernmental Panel on Climate Change (IPPC) this weekend approved arguably the most important climate science report of the decade. The landmark Special Report on Global Warming of 1.5℃ is the culmination of the efforts of hundreds of scientists from around the globe - bringing together findings from over 6,000 research papers. The headlines are significant: climate change is happening now; 1.5°C is safer than 2°C for people and for nature; and unless we act now, a climate catastrophe is inevitable. Climate change is already impacting our world, putting wildlife, nature and people’s lives and homes at risk. We can already see that the current global temperature rise of around 1°C on pre-industrial levels is impacting the UK climate. We’ve had one of the hottest summers on record as part of a heatwave which hit the entire northern hemisphere. But even this extreme weather is nothing compared to what warming of 1.5°C or 2°C could look like, and what damage it could have on a global scale. The difference between 1.5°C and 2°C is huge. It means three times as many people exposed to extreme heatwaves at the higher temperature, than at 1.5°C, and a massive 170% increase in flood risk compared to today, if a 2°C warming is reached. What does this mean for nature? Climate change makes it harder for vulnerable ecosystems and the species which rely on them to adapt – at any temperature. This is already evident at 1°C of warming. 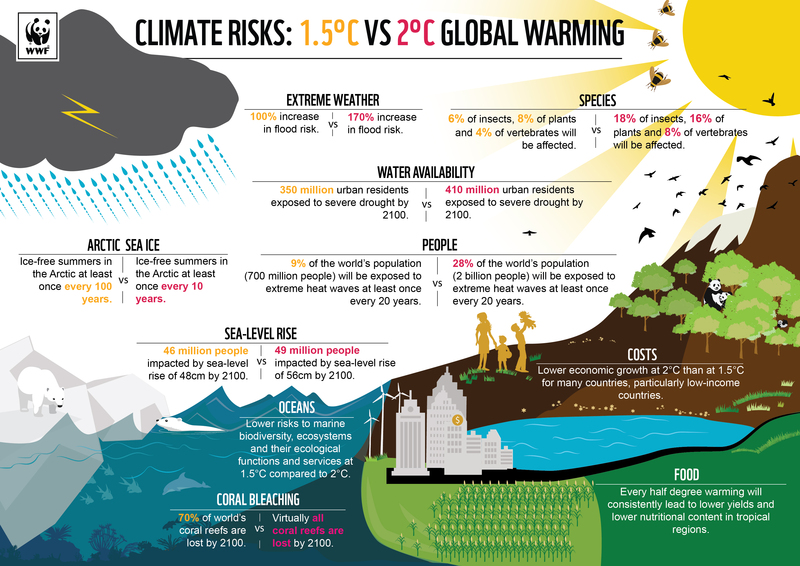 But loss of species – even to the point of extinction – is much higher at 2°C than it is at 1.5°C. The rate at which species lose more than half of their range (the area they rely on to live – to feed and to breed) doubles for plants and vertebrates; for insects, it triples. This doesn’t just affect those species directly – it could have huge effects across the food chain, and for biodiversity as we know it; the delicate web of life on which humans and nature depend is in jeopardy. It’s not just on land where we’ll see a change. Our coral reefs are already under horrific stress, with back-to-back bleaching in recent years. But if warming reaches 2°C, it could be the end of these unique and beautiful environments, with virtually all reefs lost in their entirety by 2100. Every half-a-degree matters - that is the reality of our warming world. How will the Arctic be affected? Warming in the Arctic is more than twice the global average, resulting in more visible and severe impacts than in most of the rest of the world. Sea ice that is a critical component of Arctic marine ecosystems is shrinking dramatically, with the last 12 summers resulting in the 12 lowest sea ice extents on satellite record. If we continue on our current path, and reach a global temperature rises of 2°C, an ice-free Arctic could happen once every 10 years. If we hit our target, and keep to 1.5°C warming, we can lower the frequency of this happening to once every 100 years. What happens in the Arctic doesn’t stay in the Arctic. The polar regions act like our global thermostats, with ice and snow reflecting heat back into space. If you remove that white, reflective ‘lid’ at the top of the world, you replace it with a dark blue ocean that further absorbs heat. We know what we have to do. We know that rapid and deep cuts to greenhouse gas emissions are crucial. The report highlights the need for urgent short-term to reduce global carbon dioxide emissions by about 45% from 2010 to 2030; and they need to reach net zero by around 2050. By investing in renewables, improving energy efficiency, cutting emissions from our transport, and protecting natural systems that store carbon such as forests, we can limit the impacts of climate change. There are options that can limit temperature rise to 1.5°C but the scale of the transformation is unprecedented - this will be hard. However, there are reasons for hope - in the UK for example, polluting coal-fired power plants generated 40% of our electricity five years ago; in the first half of this year, it’s generated less than 6%. What is more, investing in the technologies that replace coal has benen good for jobs and growth. Choosing a more sustainable lifestyle, such as eating a healthy, and more plant-based diet are amongst changes that we can all make to reduce our contribution to climate change. Letting our politicians know that we care about and want policy which supports our environmental aims is another crucial way of taking action on a personal level, that influences the national and international level. We have the science, the targets and the tools; what we need now is political leadership. Governments asked for this report to be done - now they must heed the science. The report highlights that current pledges under the Paris Agreement are not sufficient - they take us to more than 3°C of global temperature rises. What we really need is a political commitment for countries to strengthen their emission targets by 2020. What does this mean for the UK? The UK’s Climate Change Act, which turns ten next month, is a brilliant and world-leading piece of legislation; however, its targets were set to keep temperature rises to 2°C. They are not consistent with what new science tells us – they won’t get us to 1.5°C. This means that the Government needs to set new targets – and set out how to deliver them. Crucially, this includes living up to the commitment made in the Paris Agreement of reaching net-zero emissions. For a world-leader, and a wealthy, developed economy, this must happen in the UK well before 2050. We hope to hear very soon that the Government has formally asked the Committee on Climate Change to advise on how to achieve this. Very soon after, we need the UK to commit to actually doing it – slashing our emissions and ending the UK’s contribution to climate change.